I have seen so many precious little ones lately... those one the way and the new arrivals, that it seemed like a good time to share this song. 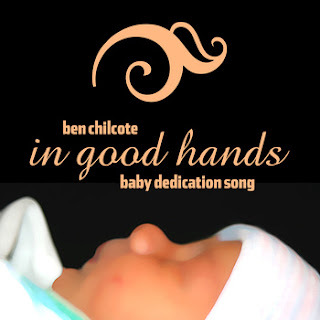 Ben Chilcote has written a song especially for baby dedications. It's called "In Good Hands", and it would be great for churches to play during their baby dedication ceremony. If you don't know what a baby dedication is, it's a promise to raise your child(ren) in the way of the Lord and an acknowledgment of the fact that our children belong to God. He has graciously entrusted us with their care and upbringing, so it it only fitting that we offer them back to the One who loves them more than we could ever imagine. When I heard this song, it touched my heart. My brother wrote a special song for my husband and I for our wedding, fourteen years ago. This song reminded me of that... not because they sound alike, they don't in any way, but because I can hear that it was written with the same heart of wanting to bless others. And be sure to check out Ben Chilcote's website here.